First, the inevitable name check: Angels in America, Tony Kushner. Well, how can it be avoided when you are dealing with a play that runs for over six hours, in two three-hour parts, that includes a hefty slab about the Aids epidemic and the decimation it caused amongst gay men in the 1980s. Having said that, Matthew Lopez, a gay Puerto Rican from Florida’s Panhandle, has written something more and slightly less than Kushner’s groundbreaker. Lopez declares he was inspired originally growing up in a conservative backwater by seeing the film of E M Forster’s Howard’s End as a young boy. Years later, he discovered reading Forster’s posthumously published novel, Maurice, that Forster had himself been gay. The linkage, Lopez writes, was profound. Life-changing. And in that discovery Lopez found his vocation and eventually his formula for writing his own story. The Inheritance thus becomes not only an intense voyage around his own personal journey and the present state of the gay community in New York but a variation on a literary theme – a novelistic play told as if within the evolution of writing a play/a novel guided by the hindsight and wisdom of an E M Forster type figure – a conversation going backwards and forwards in time between an older closeted gay man and today’s no holds barred, freedom loving gays. Following the narrative of Howard’s Way but substituting the gay community for Forster’s husbands/wives/daughters and mothers, interestingly one of the few remaining characters from the original turns out to be Margaret, played rather wonderfully by Vanessa Redgrave (in the original Merchant/Ivory film as Ruth who dies and bequeaths her house to a younger woman) as an old neighbour and chatelaine, the keeper of the spirit of the past souls of the gay men buried near a rambling house in upstate New York. It is this house that Lopez’s `hero’, Eric Glass, Jewish, middle-class, has been brought to many years ago by Walter, a kindly older gay man (Paul Hilton again, achingly eloquent and constrained) who, in a relationship with a go-getting, abrasive bi-sexual capitalist, Henry Wilcox (the widower, owner of the house and pivotal, central character in the original Howard’s End) bequeaths the house to young Eric. As in the original inspiration, the meaning of Lopez’s The Inheritance takes on many definitions and contains within it, many layers. It is, of course, about the inheritance of the house; but it is also inheritance as in history – in this case, gay history especially of Aids and that without knowing their past history, the gay community cannot forge their future. Inheritance here also contains notions of passing on, in terms of disease but Lopez also expands it out to embrace exploration of the meaning of `community’ as against merely personal. 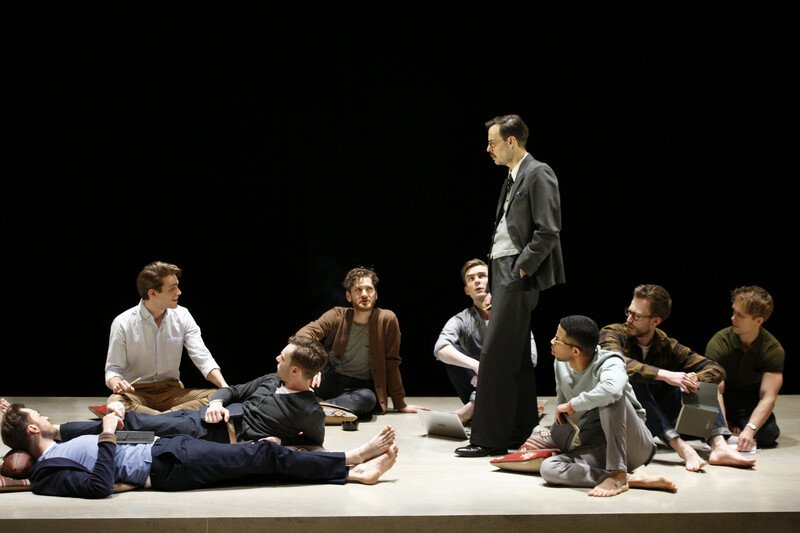 As with Tony Kushner, sometimes the number of ideas and themes whirling around and intersecting in Lopez’s The Inheritance take on a dizzying sense of hysteria. 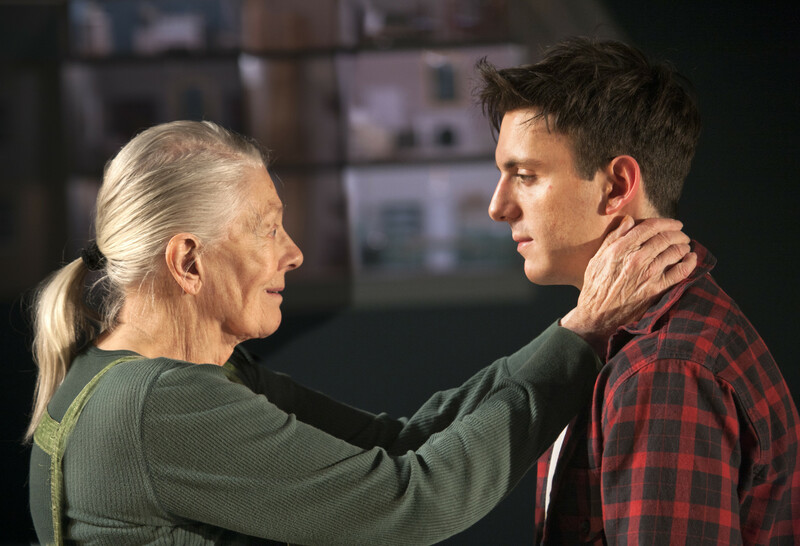 Stephen Daldry’s direction, whilst admirably concentrated and played on a plain bare stage surrounded by the other members of the cast, is also played at a wickedly speedy pace creating an atmosphere of unrelenting, camp wit. As a recreation of the Big Apple’s gay scene, I don’t doubt its authenticity and veracity but in its very authenticity lies also its excess and self-indulgence.If Lopez paints a picture of, and debates at some length the pros and cons of the personal versus the political, you wish at times for Kushner’s capacity to spread his net wider than the gay scene. Or even the political sensitivities of such home-grown now legendary gay playwrights as Noel Greig and Philip Osment. Margaret apart, it is almost as if – apart from references to alcoholic or abusive mothers and grandmothers – women are not present in the world. Redgrave and Hilton aside (and personally I can’t praise Hilton enough), it is Kyle Soller’s Eric Glass, shedding innocence and weight by the minute, who carries the narrative in a tour de force of tensile nervousness with Andrew Burnap’s Toby Darling, Gatsby like in his tragic, charismatic self-destructiveness. Samuel H Levine too, as the wannabe novelist, Adam and also as Leo, a homeless rent-boy who becomes embroiled in Toby’s downward spiral, is outstanding. But then, there is no such thing as a weak link in Daldry’s framing that demands constant and inclusive support from all concerned, for every minute of the play’s six hours or so duration. 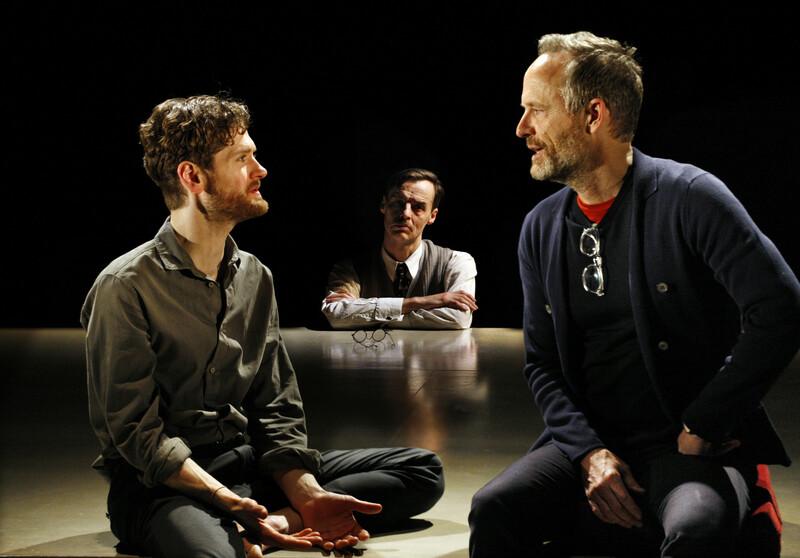 Instructive for a whole new generation, entertaining in its wit, The Inheritance is certainly riding on the shoulders of many who have gone before from Harvey Fierstein and Torch Song Trilogy (1982) onwards, as in part defiant celebration as well as a gay lament. But in its incorporation of Howard’s End and the conversation between its fictional literary inspiration and its contemporary – Lopez – it manages to create something wholly fresh and original about denial, truth and progress. British premiere at the Young Vic Theatre, London, March 2, 2018. This entry was posted in 2018, Reviews and tagged Aids related, Bob Crowley, community versus personal, David Lan, gay celebration and history, Matthew Lopez, Paul Hilton, Stephen Daldry, Tony Kushner, Vanessa Redgrave, Young Vic Theatre on March 29, 2018 by Carole Woddis.